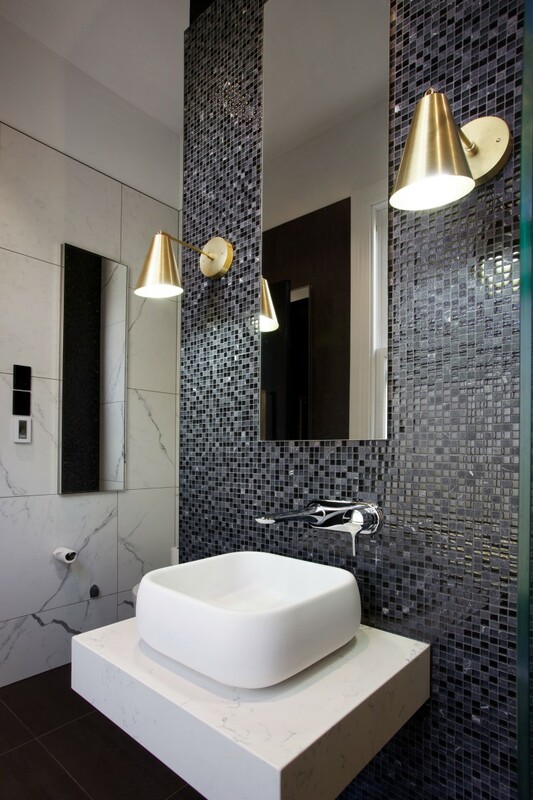 LED lights tucked behind the vanity mirror and in the shower create glowing highlights in this renovation project by architect Dion Gosling. 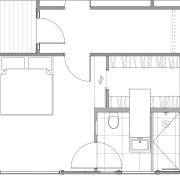 There can be few greater design challenges than working around a central, intrusive object. 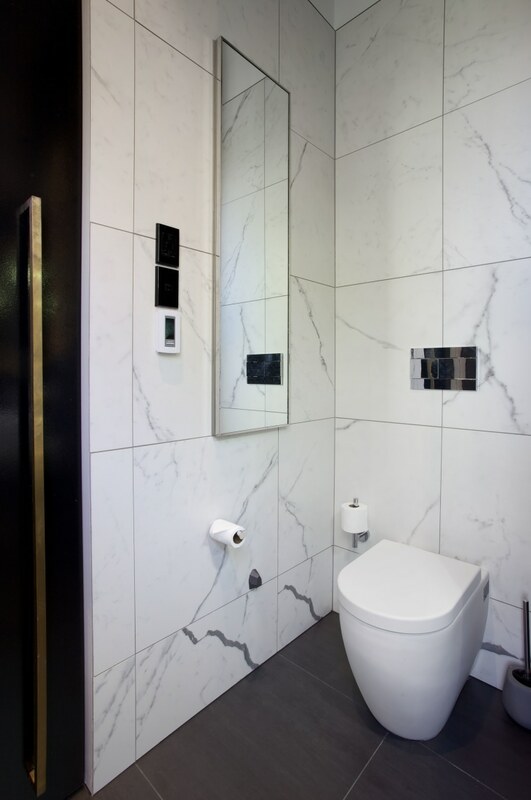 A chimney that would have been prohibitive to remove stood at the heart of the space available for this ensuite by architect Dion Gosling. 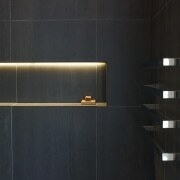 "The client wanted a cosy, cave-like aesthetic for the bathroom, which had limited space. 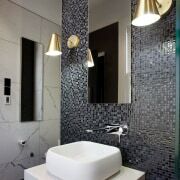 Faced with the chimney, we divided the room into two around it, with the shower in black tiles on one side and the toilet in contrasting marble-look white tiles on the other, and black floor tiles. 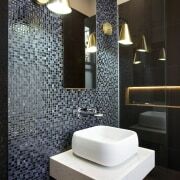 "We utilised the chimney breast by facing it in shiny mosaics and cantilevered the sink off it. 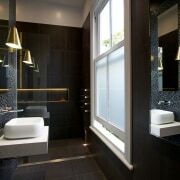 "A new sash window, in keeping with the home's age, was introduced opposite this, with frosted glass for privacy. 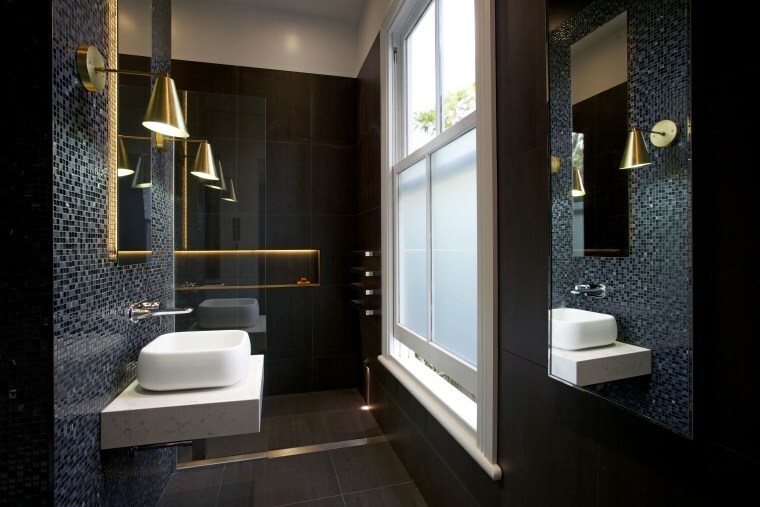 Mirrors above the sink and in the toilet area bounce light through the bathroom and bring a touch of greenery from an adjacent park into the mainly two-tone space. 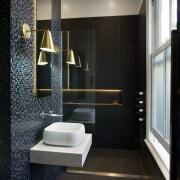 Black, white and touches of brass all come together to create a refined air in this bathroom by Dion Gosling. 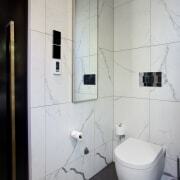 With limited room to move, the bathroom cupboard is recessed behind the mirror in the toilet area, and shelf space in the shower is set back into a wall niche. 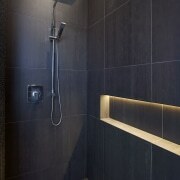 A floor drain allows a seamless flow between shower and toilet area. The pivot entry door, with brass pull, is a pleasure to use and further optimises space.